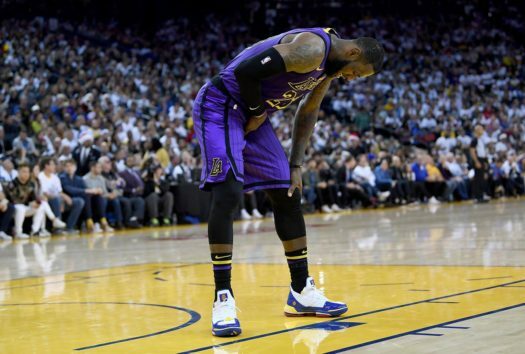 Despite LeBron leaving the Golden State Warriors game on Christmas Day early in the third quarter with a groin injury, the Los Angeles Laker’s still left with the win. After he had left early he didn’t seem worried about the injury. The injury occurred when he was dribbling the ball up the court, he got cut off by Draymond and tried to stop quickly which caused him to lose his footing and slipped and fell awkwardly before passing the ball out to Lonzo. When the Lakers’ team doctor was examining him on the court LeBron could be seen saying he had felt something pop. If his injury isn’t serious the Laker’s pulled off a huge win. They took over the 2 time defending champions in a match up without their best player for the last 20 minutes of the match up. James is unlikely to return until next week, as he continues to rehab on his injury that has kept him out of the game he loves for quite some time.